Anna and Wendy discuss episode 33 of Chronologically LOST, Episode 033 – October 3-7 2004 (days 12-16), featuring Sayid’s encounter with Rousseau, Hurley’s first (and hopefully last) island open, Claire’s nightmares and Jack’s ever-increasing certainty that she’ll be giving birth soon and on the island, and Hurley taking a census. Podcast length 1 hr 32 min. Anna and Wendy discuss episode 32 of Chronologically LOST, Episode 032 – September 30-October 3 2004 (days 9-12), featuring Shannon’s inhalers, Sawyer’s letter, Charlie and Claire and the invisible peanut butter, Sayid leaving, finding a cable, and getting caught in a trap, and Ana Lucia becoming suspicious of Nathan. Podcast length 1 hr 25 min. Never Let It Fade Away: What LOST Means to Us: a special edition of Jacob’s Cabin LOST Podcast that featured many LOST podcasting friends and listeners sharing their stories of how they got into LOST and what the show meant to them, released on July 17, 2009, during the lengthy season 5 – season 6 hiatus. Anna and Wendy discuss episode 31 of Chronologically LOST, Episode 031 – September 28-29 2004 (days 7-8), featuring Charlie’s struggle with Locke and himself to ditch her heroin addiction, conversations about moving to the caves with a few folks following through, Michael returning the watch to Jin, Goodwin catching a chicken, Libby comforting a still-silent Eko, Charlie causing a cave-in where Jack is trapped, and Sayid working to triangulate the signal, only to get knocked unconscious. Podcast length 1 hr 22 min. Never Let It Fade Away: LOST official soundtracks, beautiful musical scores composed by Michael Giacchino. 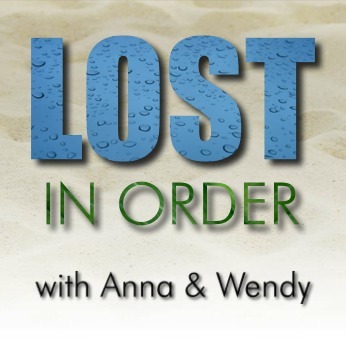 Anna and Wendy discuss episode 30 of Chronologically LOST, Episode 030 – September 27-28 2004 (days 6-7), featuring stolen water, Jack chasing after his father and finding the caves, the famous “live together, die alone” speech, Jin attacking Michael, Charlie’s unpleasant encounter with a beehive, the discovery of Adam and Eve, and Sun surprising Michael by speaking in English. Podcast length 1 hr 22 min. Never Let It Fade Away: LOSTies with Jed and Cara, a vidcast from two of our dear LOST podcasting friends! Check out all 71 of their episodes on their website or on their YouTube channel. Episode 100X: 100th Episode Celebration!